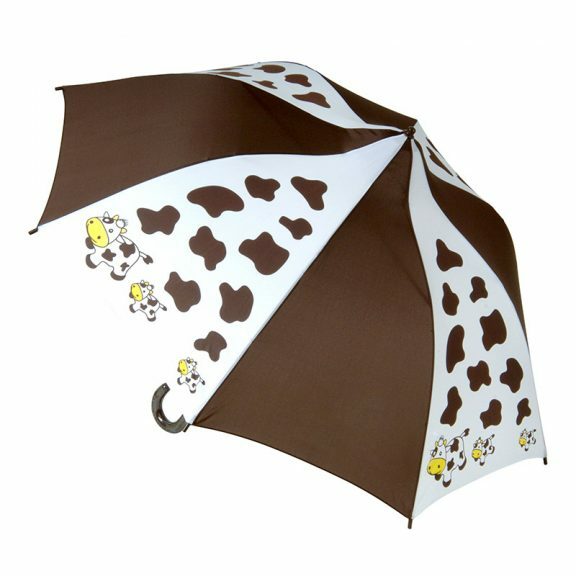 Cow print Umbrella for kids - How Now Brown Cow? 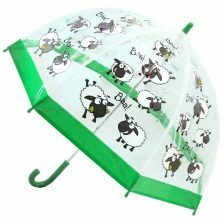 Children’s umbrellas designed here at Umbrella Heaven have the same amount of thought and detail put into them as an adults. We like the umbrellas to be fun, strong and windproof, just like this one. Children’s Cow Print Umbrella – the “How Now Brown Cow”! 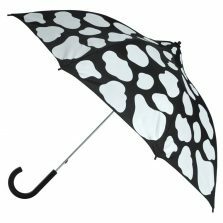 Are you looking for child’s animal or cow print umbrella? We have a number of cow umbrellas up here. 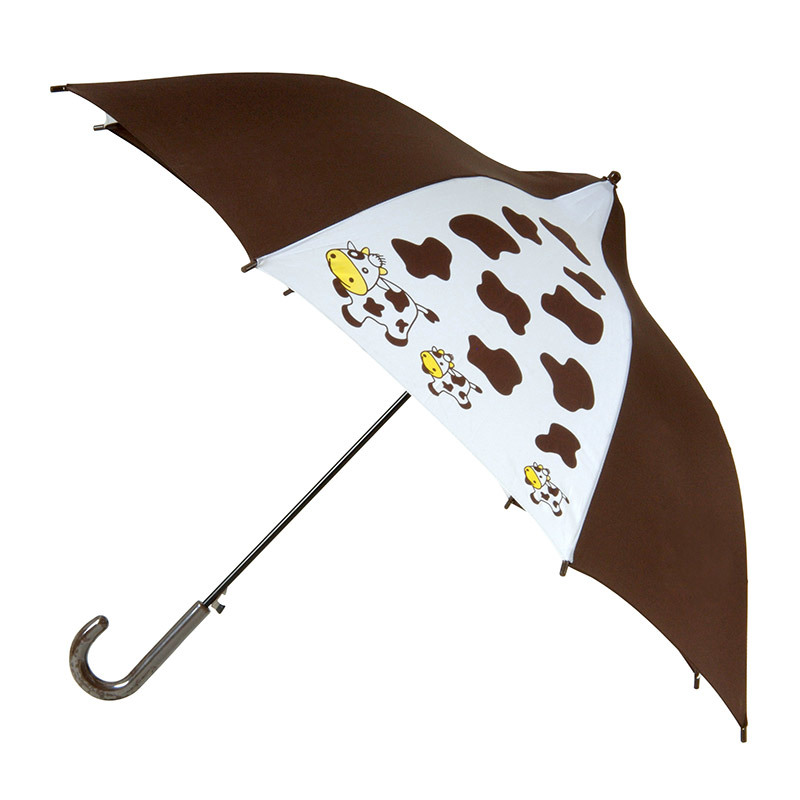 Here we have our ‘How Now Brown Cow’ Children’s Umbrella. A pagoda shaped child’s umbrella with alternate plain brown and patterned panels. It also has the renowned Rob McAlister Windproof Technology built in. 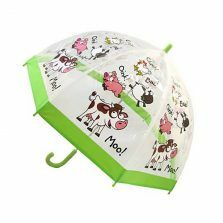 These fun children’s cow umbrellas will bring a smile to any child with their unique shape and wonderfully whacky cow cartoons. 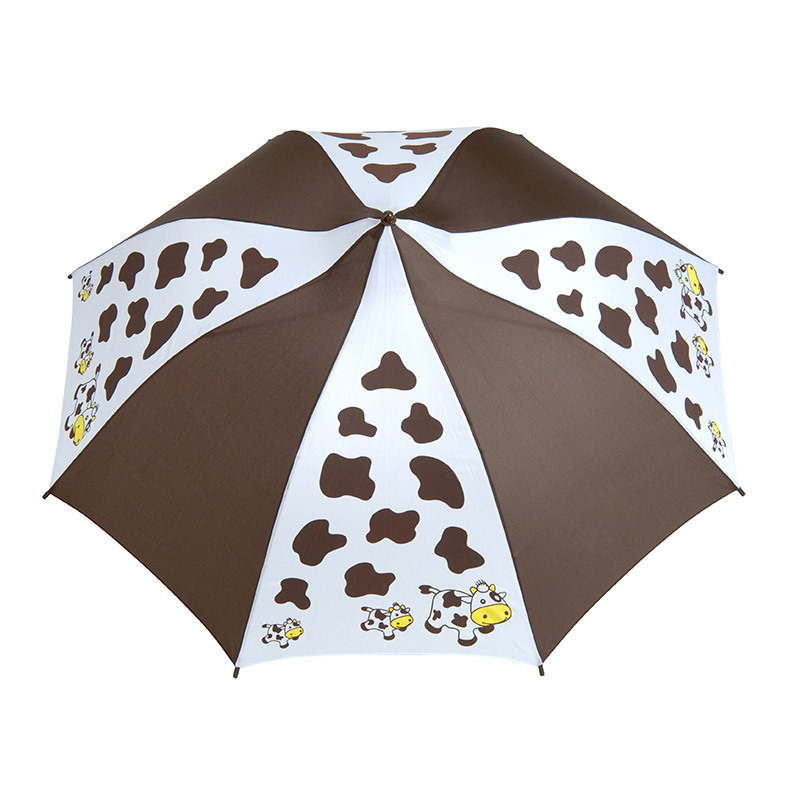 These brown and white children’s cow umbrellas are light-hearted but very strong and functional as they have our special wind-resilient technology and look absolutely fantastic. The Canopy width, when open is: 94 cm / 37″, and the length (top to tip) is: 78 cm / 30.5″. Apparently there is a current trend at the moment for anything with a Cow Print or design on it. Wellies, raincoats, mugs . . . just about anything with a cow print on is worth having. 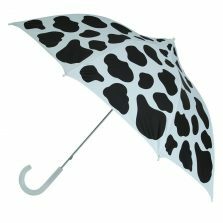 We are biased though and would highly recommend that you have at least one cow print umbrella in your house! You could have 3 if you like but 1 is a start. Why not build up your collection? Fun and funky cow print design. See some more of our lovely kids umbrellas! We have a large range of umbrellas for girls and boys. Our collection includes character umbrellas, clear dome PVC umbrellas, cartoon umbrellas and many more.